Mac & Cheesus is a super holiday seller and a year-round steady. A fun gift item with great shelf presence, the 12oz. package serves up a lot of premium cheesiness! MSRP $9.99+ Free shipping on all opening orders, no minimums. – 12 units per case. Email Team Cheesus using our contact form or message the Mac Daddy on Facebook or Instagram. We’ve got our top 10, who’s next? The Mac Daddy is always searching for some heaven on earth — retailers who want to party with Cheesus! 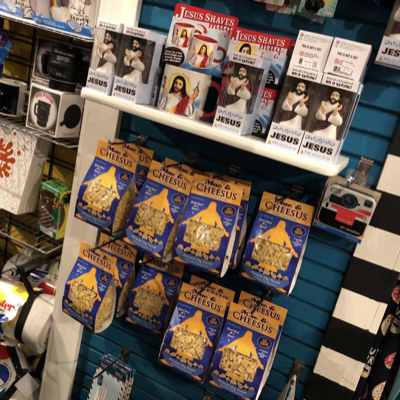 Have a suggestion for a great store near you that needs Cheesus in their life? Be an angel and please holler it at us! If your shop decides to hang with C, in addition to eternal gratitude, praise be to thee will be expressed in the form of Almighty Mac packs.